The Chemung River offers the following recreational activities fishing, canoeing, rafting, kayaking, swimming, and hiking. In the last few years there has been a lot of interest in the river with the addition of many new boat launches and access points. This region has finally realized what a great asset the river can be. The Chemung River is formed when the Tioga River and the Cohocton River merge at Painted Post just west of Corning. From there it flows to the southeast and meets up with the north branch of the Susquehanna River in Sayre PA. The state has also been stocking Tiger Muskellunge for several years now and it is possible that some of these may be over 20 pounds by now. The state of NY has also stocked American Shad fry in an attempt to restore these fish to these waters. At one time the Chemung River once held the claim to the states record walleye of 15-pound, 3 ounces. This awesome walleye was caught in the early 1950s and held the state record for more than 40 years. Stories of larger walleyes are told and in time it may well produce another record breaking fish. Pictured here is Gordon Bennett from Elmira NY. This is a photo of a hybrid striped bass caught from the Chemung River in June 0f 2001.The fish pictured is 7.5 lbs and 22.5 inches long. It took nearly 20 minutes to land this fish. I was using 4 lb line and a ultra light St. Croix rod. This was one of 6 that I had caught all year. It was released and could be caught again this year.This may not be one of the biggest hybrid bass ever caught, but very few people will ever catch one out of the Chemung River. Hybrid bass are not native residents of the Chemung River or anywaters in NY for that matter. They are stocked in very few lakes across the state. The Hybrid Bass in the Chemung River are from the stock in PA. at the Tioga and Hammond Dams. The dams are over 40 miles away, which means that this fish and the others caught, made there way from the dams. This information has been checked out with the DEC and they confirmed it. This may not be one of the biggest hybrid bass ever caught, but very few people will ever catch one out of the Chemung River. It truly is a trophy in its own right. I hope you enjoy the picture. 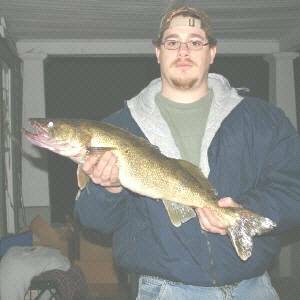 In November of 2004 Ron Buchanan of Elmira, NY caught this incredible walleye from the Chemung River. This amazing Chemung River walleye was 29 inches long and weighed in at just over 9 pounds. Ron was fishing just after dark. His favorite method is casting stickbaits upstream and retrieving them just fast enough to keep up with the current. During the retrieve he will give the bait an occasionally twitch. This is sometimes what triggers he strikes. The best colors are perch, silver and black or blue combo. This is an exceptional fish and Ron is going to have this walleye mounted. Ron Peterson from Elmira, NY displays a very nice Chemung River Smallmouth Bass. 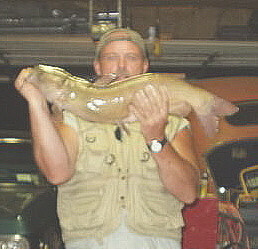 This fish was caught in July 2002 around 8:30 pm in the evening in a deep pool just below the rapids. During the warmer months of the summer Bass and Walleyes will hold in the rapids where the moving water tends to be more oxygenated. This nice smallmouth fell victim to a White Rooster Tail. Pictured here is Steve Brady from Chemung NY. 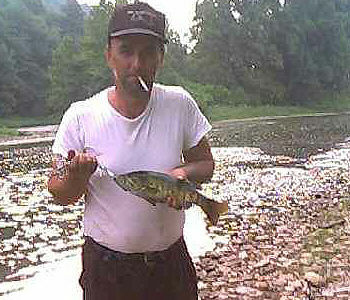 He was fishing the Chemung River near his home using night crawlers for bait. He was catching bass, walleye, and carp. Then much to his surprise he hooked this huge 12 pound Catfish. The big cat was just under 30 inches long. Steve said the fishing in the river has been fantastic this year and should remain good all summer. Low water has not been a problem this year. Yikes !!! Look at that monster carp!! 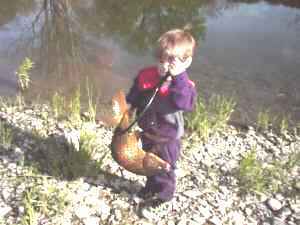 Here is a very happy youngster with a huge carp caught in the Chemung River near the Lowman cross over. Over looked by most fisheman carp offer a viable alternative when target fish are not cooperating. Also they offer a good way to keep your tackle from getting rusty because they can and will give it a good work out. Thanks to Jamie Rinker for submission of this photo. Carp are not a native species to NY waters. They were introduced into New York State waters in 1831 from Asia. They are now found in most all of the states lakes and rivers. The carp inhabiting NY's waters can grow very large and some specimens may reach a weight of over 50 pounds. The New York State record Carp weighed an amazing 50 lb. 4 oz. 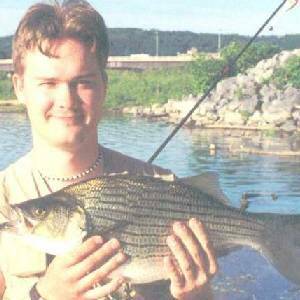 It was caught by Charles Primeau, Sr. while fishing in the Tomhannock Reservoir on 05/12/95. He was using a Night Crawler for bait. Late spring is when the carp begin the spawning process. Carp will spawn in weedbeds or grassy shallows. When spawning they will thrash about wildly and even leap out of the water like a salmon. A large female carp will produce over 10 million eggs. Carp feed on a variety of foods including plants, insects, fish eggs, smaller baitfish, worms and crusteaceans. Anglers fishing for carp often make doughballs to use as bait they also will use whole kernel corn where it is allowed. Most all of New Yorks lakes and rivers support a pouplation of carp however, some of the best waters to fish for carp are the Hudson River, New Croton Reservoir, Amawalk Reservoir, Rondout Reservoir, Belmont Lake, Peconic River, Tomhannock Reservoir, Susquehanna River, Chemung River, Goodyear Lake, Sacandaga Reservoir, Saratoga Lake, Mohawk River, Lake Ontario, Cayuga Lake, Lake Erie, Kinzua Reservoir, Cuba Lake, Chautauqua Lake, Allegheny River, Niagara River, and the Erie Canal.